Later topic: Thats one way to use a press! I volunteer at a local museum, and recently uncovered a cabinet full of metal type, misc tools, embellishments, and ink, the cabinet is easily 30 years old, and came from a military printing office. I would like to build a small (legal size max) press to utilize this type for the museum. Any tips? 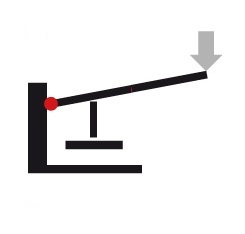 Presses must be robust and precise; managing tons of pressure applied to depths measured in thousandths of an inch. Building such machinery to also be safe to operate is not trivial. Hand-fed presses are widely available and affordable. Somewhat ironically, the larger freestanding presses are often much less expensive than the tabletop models. Frequently, a press will be donated simply due to space constraints. I’d check the classifieds here. I recently saw a C&P for ~$500. Not likely anyone could build a decent press for that small amount cash. I acquired some serious engineering equipment, (i.e.Big Centre Lathe, Big universal Milling machine and Tool Cutter Grinder) but then the problems began, even with access to many machines, (presses) to study, but no drawings, stumbling block number ONE, first of MANY, current drawback absence of SINE VICE, to machine, for example, the angular rakes on various chases, to accomodate the retaining lugs.?? £200 for a cheap one £1,000 for a good one. Having major parts Castings/Forgings in cast Iron, (like trying to buy into Fort Knox) i.e. Main Frames, Bed, Platen, Did look into this, until one off price, reared its head, plus did not even get as far as do *new* (cast iron) castings have to be aged/pickled or artificially treated prior to machining? Here in U.K. am in contact with with aluminium foundry that will cast, in Ali. (from patterns supplied) main sections virtually ready to machine, Mill, Drill, Ream, etc. from good grade Aluminium.!!! One possibly slight advantage, (U.K.) we have good access to material stocks in imperial measurements, for shafting, bearings, bushes etc. As most letterpress machines are/were imperial dimensions, on construction, and some specifications may yet be available, it may help??? I can/am making roller stocks from the centre columns of ex Auto McPhearson struts, it is precision material and turns well with tipped tools. I can/am making trucks from Brass, Steel, Aluminium, Nylon, Industrial grade Plastic!!! After reading the vast amount of column inches and amazing methods for setting the rollers at the correct height, must surely involve the incorporation of adjustable roller/bed bearers??? I have just modified, what was effectively, a throw away Adana 5 x 3 (Milled the roller bearer tracks down by 1/4 of an inch and Milled 2 auxiliary tracks from 1/4 inch X 1 inch stock,) works well even with *tatty* rollers, no more messing “to tape or not to tape”. Surely a must for a modern REPRO, from scratch. … … … … … …”*”*”*”*”*”*”*”*”… … … … … . .
Just a few for starters… Hang in there Buddy… . If You end up as the only one who has tried, you will be the only expert… Win loose or no result??? My only ally, is John Harrison, THE John Harrison, Mr Longitude, He is still looking over my shoulder, and at least every third failure, I catch it in the neck???? If you will, mail, I will happily share my odd success and my Many failures. Nil Desperandum. Good Luck. Whilst buying a second-hand commercially manufactured press will always be cheaper, and will get you far better quality than making one yourself, some people have made their own presses as an expensive project for personal satisfaction. Twenty years ago I built an interpretation of a wooden common press to print up to 12in by 18in. This used mostly reclaimed timber with an old engineer’s surface plate for the platen and a trench strut for the screw. It would have been cheaper and easier to buy a second-hand commerially manuafactured press but I enjoyed the design and construction process and got more or less what I wanted out of the project. With care I can get tolerable results from this press though rarely as good as I can far more easily achieve on any of my three commercially manufactured presses. So - if you really enjoy workshop projects and are not concerned about best value or highest quality, check out a couple of older threads somewhere here on Briar press about building presses, and look at images of ‘wooden common presses’ and ‘English common presses’ online to maybe spark some design concept ideas off. However, if you are seeking to minimise expenditure and to maximise print quality, then look around for a second hand commercially manufactured press - they are frequently advertised on this website and on ebay. I’m located in the UK so lack detailed knowledge of the types of presses available second hand in the uSA but members of this forum have immense expertise and experience and can advise you of options, likely prices, and aspects to look out for or avoid. 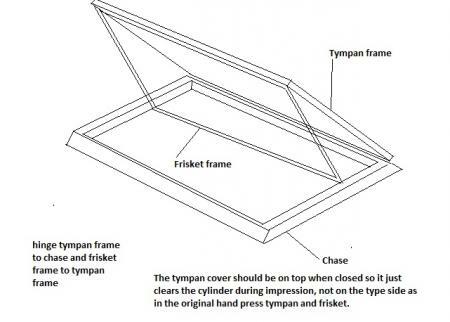 If you just want to demonstrate a simplified and small printing process, you could build a small simple press like the second diagram below (with minor design changes) and equip it with a metal chase with a tympan and frisket as in the first diagram. This sort of system will allow a small simple demo of printing at relatively low cost to build it and very safe operation suitable for hands-on participation by children. Contact me if you’d like additional info. I took a look at photos of common hand presses. This is what I built from them, the bed is 12x18, bed stone is a 1”thick piece of black granite, the frame is quarter sawn oak, the platen is quarter sawn hard maple, and the screw is a small building jack. If you have some ability at wood working you can do it. I’ve added a print that I did on this press, the paper is 10x16. Sorry folks. the photos didn’t upload. Email me and I’ll send them to you. A Ramage style Press might involve less work? A good and inexpensive book to pick up is titled ‘The Works of Ralph Green” published by Hal Stern at Ye Olde Printery in 1981. It reprints The Iron Hand Press In America, A History of The Platen Jobber, and On Making A Printing Press. The last title doesn’t give exact details on how to make a press, but it might stimulate your creative side enough to get you started. Another title that is relatively cheap is the book about the creative printing of Morris Cox titled “Gogmagog” by David Chambers, Colin Franklin, and Alan Tucker, published by Private Libraries Association, Pinner, 1991. In it is a good description of making a rolling cylinder press, very similar to a galley proofing press. I think that others on this list have made similar presses - one using an old scuba tank if I remember correctly. If you do a search on my name here, you’ll find a number of press-building articles and discussions. You will also find articles on casting rollers, and making your own plates. There used to be a quite strong “build-it-yourself” component here at Briar Press…. but most of the folks I know have moved on to other sites nowadays. Other sites? Can you elaborate?